The Black and Decker CHV1510 is an economical cordless vacuum cleaner that meets the basic cleaning requirements of the average household. While being reasonably priced on the market, it comes with an impressive 2-year warranty on the device and its battery. A predecessor of the Black and Decker BDL2000L, both products retain the same shape and design, and offer very similar specs. Interestingly, the B&D CHV1510 has a more powerful battery than the BDL2000 by up to 1 air watt. However, the CHV1510 employs an old tech 15.6-volt nickel cadmium battery, which may lead to some fading issues when used over time. 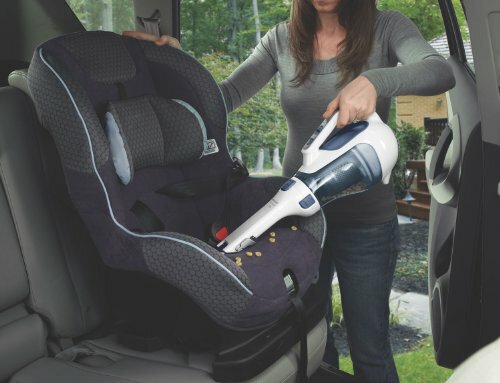 The Black and Decker CHV1510 is a lightweight vacuum weighing only 3 lbs. With its 15.6-volt battery, it still matches the suction power of the BDL2000L that is powered by a lithium ion battery. Given the capacity of the battery to yield 25 air watts, it’s an amazing product that is available at almost half the price of the BDL2000L. Owing to the powerful suction capacity, you may find the device slightly noisier than other similar products. The nickel cadmium battery can take a long time to be fully charged. It is also prone to fading. However, handheld vacuums are only intended for minor cleanup tasks unlike stick vacuums, so it shouldn’t be much of a problem. As the battery begins to fade, you will notice a deterioration in the suction power, which indicates that the battery needs to be charged again. 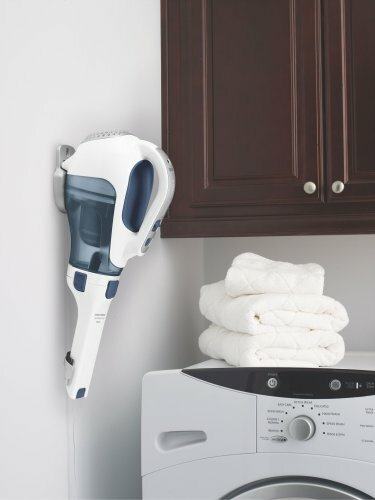 It features a rotating nozzle that allows it to reach tight and awkward areas of the home. It comes with a built-in brush and crevice tool. It makes use of cyclonic action to prevent the vacuumed dust from blocking the filter openings, enabling the device to maintain its suction potential even after filling up with dust. The device’s wide mouth helps in cleaning larger debris. The handheld vacuum is easy to use. It has the on/off button right on its handle. To start using the device, simply hold the device in your hand and use the thumb to power the device on. Start vacuuming the spots that require cleaning. The Black and Decker CHV1510 isn’t meant for cleaning floors. Its primary function is to take care of spot cleanups. It can assist homeowners in cleaning areas where a stick vacuum is unable to reach, such as windows, walls, edges, corners and upholstery. It has a powerful suction capacity that picks up cereal, pet hair, dust, pet poop and other objects without any hassle. It isn’t meant to pick up wet objects though. Also, avoid picking up heavy items, such as coins with this device. The locking mechanism of the crevice tool is known to encounter problems. If it is pushed to hard, it can retract, having you to pull it out again. This can be problematic when using the device on upholstered furniture or a vehicle carpet. There is the other option of using the device on a carpet or similar surface with the crevice tool removed. However, it isn’t meant for a deep clean of the carpet. It is also effective in removing pet hair from a carpet even though it lacks an attachment specifically meant for pet hair removal. It comes with two attachments including a foldable brush and a pull out crevice. The nozzle can be rotated to make it easier to clean awkward areas. While the company doesn’t specify any charging time, it recommends users to keep the device plugged in for 24 hours for initial use. It has a washable cloth filter housed in an outer filter made from plastic. The outer mesh type filter blocks larger debris from going to the cloth filter. This makes it easy to clean the cloth filter when it gets dirty. Particles, such as hair and dander are blocked by the outer filter with only dust making it to the cloth filter. The dust container has a capacity of 0.6 liter. Cleaning the container is easy. Simply rinse it under warm water and then let it dry. It is a decent handheld vacuum with powerful suction capacity. If used with care, it should easily last more than a couple of years.